This Grizzly is huffing and being aggressive. Grizzly Bears are a species brown bear known by the scientific name Ursus arctos horribilis . Grizzlies are the largest animals in North America. With their huge body size and strength, they will eat anything they can find. Grizzly cubs can survive, and hunt at a young age. Their life span is not that long compared to those in captivity. The Grizzly can be very strong and aggressive but not all the time. If they are aggressive, read below on how to survive a Grizzly Bear Attack. The Grizzly bear is the biggest animal in the Pacific Northwest standing 8ft tall on two paws and 4ft on all four. The Grizzly can intake 90lbs of food during warmer times to keep warm during the winter. Grizzlies roughly weigh up to 350-900lbs. 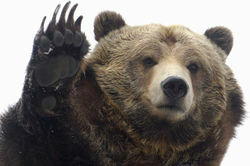 The paw of the Grizzly is 15 inches, and can kill someone in one swipe. They have poor eyesight but they have a great sense of smell, Fascinatingly it's better then a Hound Dog. They were made by God to be big with powerful strength. Their huge muscles on their back help them dig their dens and be dominant over other animals. Grizzlies have white tipped fur and rounded ears. They are extremely fast. Grizzlies can reach up to 35mph; also they are good swimmers. When they are cubs they have the ability to climb trees, but as they age they loose that ability. The life cycle of a Grizzly bear is quite interesting. The mating season is between May and June. The female Grizzly will mate with almost all the males she encounters in her area. The Female will breed up to every 3 to 4 years, but it will take a few years for the young cubs to come out and see the light. When the cubs are born, they will not be able to see, and will lack fur. The cubs will stay with their mother for three years for the protection from other bears, wolves, and cougars.When the cubs hit 4 years old the mother will stop protecting them, and forge their food. They will leave and go hunt for themselves. While the young adult cubs go hunting, the mother will go and breed again. Some Grizzly bears will be mature enough to breed at the age of 4 but some will need 18 more months until the are sexually mature. The usual life span for a Grizzly bear is 15-20 years in the wild. One bear has lived to be 47 years of age in captivity. Grizzly bears can be located from all over. 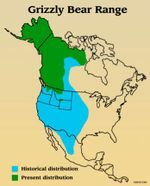 They are found from North America, Canada, Pacific Northwest, and Alaska. They live in high slopes and lower wetlands. The females and the males have different mind-set of acquiring land. The males require 200-500 miles and the females require 50 -300 miles of land. Their food/ diet consumes of plants, ants, berries, deer, elk, fish, grass and roots. During October the Grizzlies start hibernating, they spend up to 2-6 months sleeping in their den. 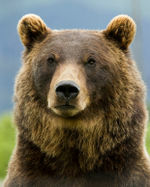 Grizzlies do not eat, drink, poop or urinate while hibernation. Sometimes the bear will arise because of distractions, they will use the same den again after the previous year. To know what a bear is telling you, it’s always good to know this. 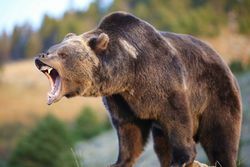 If a bear stands on its hind legs it is just looking for a better view, it does not mean it is going to get aggressive. If they are annoyed they will sway their head, huff, snort, pop their jaws and crackle their teeth. Also if they are aggressive they will lower their head and have their ears back. Keep these things in mind if you encounter a bear attack, always keep bear spray which is also known as pepper spray. Don’t run on flat ground because a Grizzly will catch up to you, but unless you are running down hill the Grizzly will have a hard time because its front legs are shorter than the back. Play dead, cover your head and neck and do not move if you are being attacked or come really close of an encounter. If you are to scared to do any of these things you can also hit its nose. ↑ BearLife.Org, 2008. bearlife.org Grizzly Bear. Web. published 2008. ↑ 3.0 3.1 Western Wildlife Outreach Grizzly Biology Western Wildlife Outreach. Web. April 27, 2017. ↑ Defenders of Wildlife. Grizzly Bear Defenders of Wildlife. Web. published August 11, 2014. ↑ Willcox Louisa. Grizzly Times Grizzly Times. Web. published 2001. This page was last modified on 22 May 2018, at 14:34.